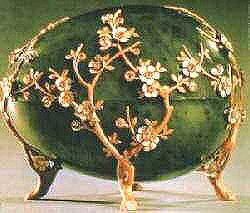 The 1901 Kelch Apple Blossom Egg, also known as "Jade Chest Egg", is made of nephrite, green and red gold, silver, diamonds, matt pink, and white enamel and velvet lining. The Egg is made of a solid piece of carved nephrite and forms the astonishingly thin polished shell of this Egg. It stands on four carved gold feet, fashioned as twisted branches. 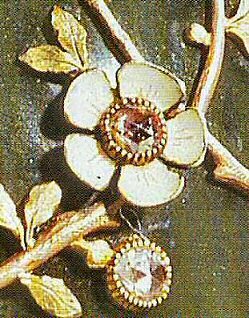 These branches which are carried out in red and green gold have spreading and interlacing twigs with knots, veins and patches of moss, bearing gold leaves and pink foiled rose-cut diamonds within silver-mounted with and pink enamel petals. The Egg was designed as a jewel case; the surprise is lost. 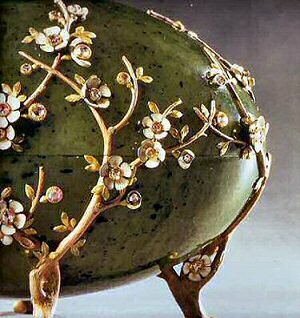 This is one of the largest eggs made by Fabergé. It was another of the Kelch Eggs initially mistaken as a present to the Dowager Empress Maria Feodorovna. The Eggs's design reflects the contemporary fashions of Art Nouveau and the Japanese style. In 1920 one of the six Kelch Eggs sold by Morgan in Paris to A La Vieile Russie, Paris. 1928 sold to an unknown buyer from the United States. 1928-1994 private collection, US. 1994 sold by Christie's, Geneva, to an anonymous Russian buyer. November 1996 sold by Sotheby's, Geneva, to Adulf Peter Goop, Vaduz, Liechtenstein. In 2010, shortly before his death, donated by Adulf Peter Goop (1921-2011) to the country Liechtenstein.